Point-to-Site connections use certificates to authenticate. This article shows you how to create a self-signed root certificate and generate client certificates using MakeCert. If you are looking for different certificate instructions, see Certificates - PowerShell or Certificates - Linux. MakeCert is deprecated. This means that this tool could be removed at any point. Any certificates that you already generated using MakeCert won't be affected when MakeCert is no longer available. MakeCert is only used to generate the certificates, not as a validating mechanism. The following steps show you how to create a self-signed certificate using MakeCert. These steps are not deployment-model specific. They are valid for both Resource Manager and classic. 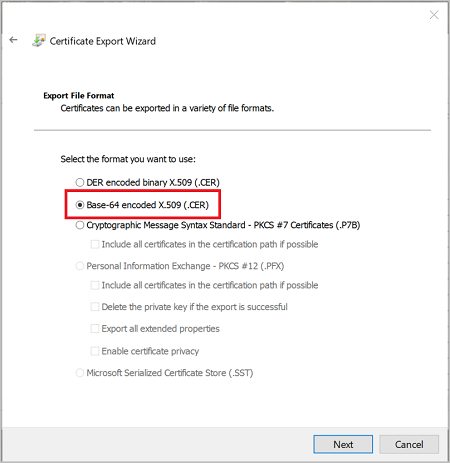 Create and install a certificate in the Personal certificate store on your computer. The following example creates a corresponding .cer file that you upload to Azure when configuring P2S. Replace 'P2SRootCert' and 'P2SRootCert.cer' with the name that you want to use for the certificate. The certificate is located in your 'Certificates - Current User\Personal\Certificates'. 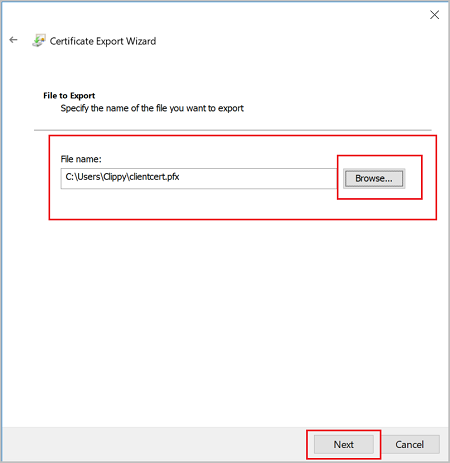 To obtain a .cer file from the certificate, open Manage user certificates. 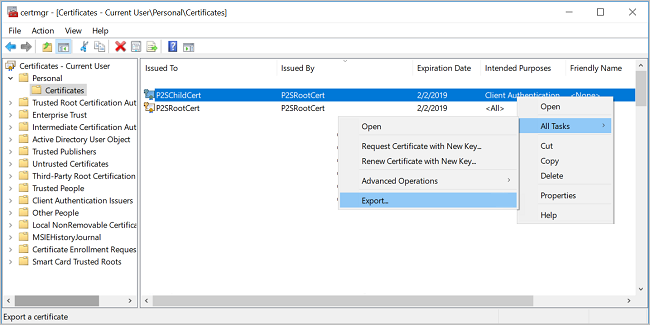 Locate the self-signed root certificate, typically in 'Certificates - Current User\Personal\Certificates', and right-click. Click All Tasks, and then click Export. This opens the Certificate Export Wizard. If you can't find the certificate under Current User\Personal\Certificates, you may have accidentally opened "Certificates - Local Computer", rather than "Certificates - Current User"). If you want to open Certificate Manager in current user scope using PowerShell, you type certmgr in the console window. 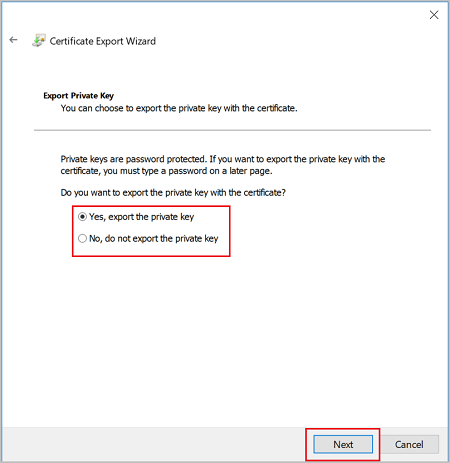 Select No, do not export the private key, and then click Next. On the Export File Format page, select Base-64 encoded X.509 (.CER)., and then click Next. Your certificate is successfully exported. If you open the exported certificate using Notepad, you see something similar to this example. The section in blue contains the information that is uploaded to Azure. 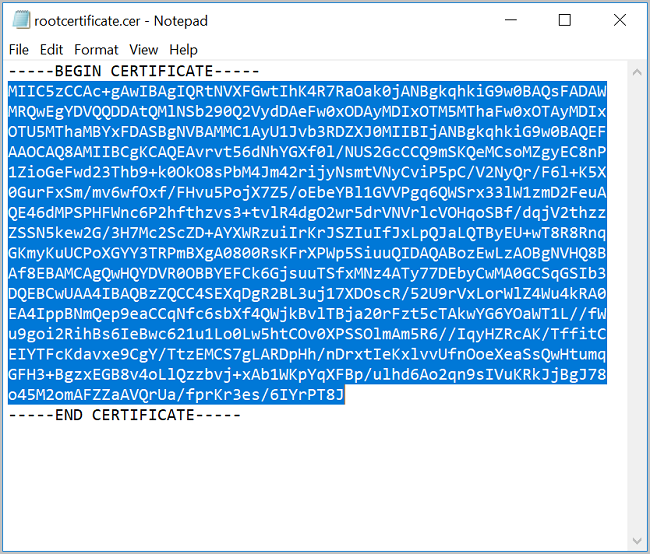 If you open your certificate with Notepad and it does not look similar to this, typically this means you did not export it using the Base-64 encoded X.509(.CER) format. Additionally, if you want to use a different text editor, understand that some editors can introduce unintended formatting in the background. This can create problems when uploaded the text from this certificate to Azure. The exported.cer file must be uploaded to Azure. For instructions, see Configure a Point-to-Site connection. To add an additional trusted root certificate, see this section of the article. You may want to export the self-signed root certificate and store it safely. If need be, you can later install it on another computer and generate more client certificates, or export another .cer file. 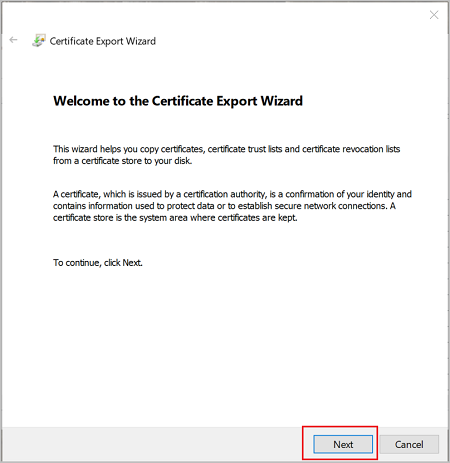 To export the self-signed root certificate as a .pfx, select the root certificate and use the same steps as described in Export a client certificate. You don't install the self-signed certificate directly on the client computer. You need to generate a client certificate from the self-signed certificate. You then export and install the client certificate to the client computer. The following steps are not deployment-model specific. They are valid for both Resource Manager and classic. The following steps walk you through generating a client certificate from a self-signed root certificate. You may generate multiple client certificates from the same root certificate. When you generate client certificates using the steps below, the client certificate is automatically installed on the computer that you used to generate the certificate. If you want to install a client certificate on another client computer, you can export the certificate. On the same computer that you used to create the self-signed certificate, open a command prompt as administrator. Modify and run the sample to generate a client certificate. Change "P2SRootCert" to the name of the self-signed root that you are generating the client certificate from. Make sure you are using the name of the root certificate, which is whatever the 'CN=' value was that you specified when you created the self-signed root. 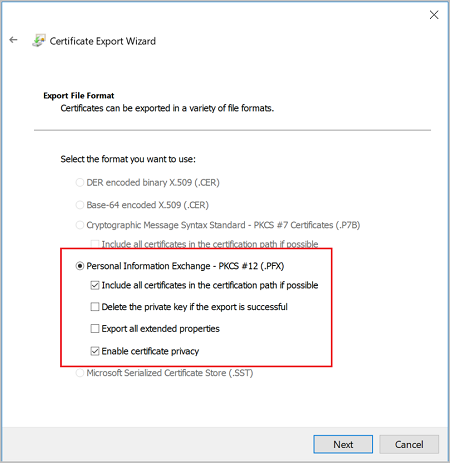 Change P2SChildCert to the name you want to generate a client certificate to be. If you run the following example without modifying it, the result is a client certificate named P2SChildcert in your Personal certificate store that was generated from root certificate P2SRootCert. When you generate a client certificate, it's automatically installed on the computer that you used to generate it. 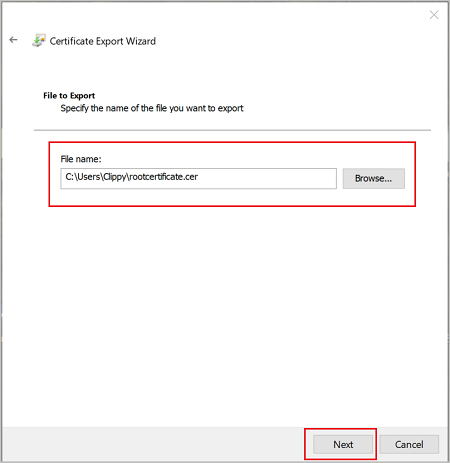 If you want to install the client certificate on another client computer, you need to export the client certificate that you generated. 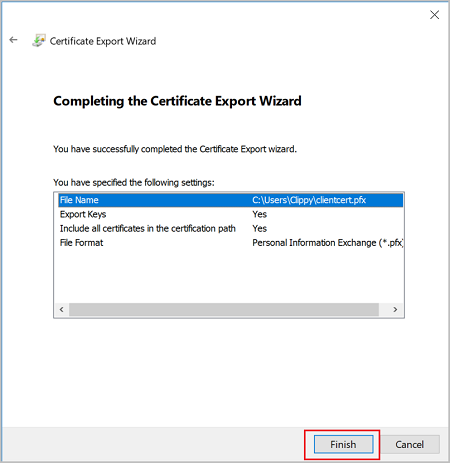 To export a client certificate, open Manage user certificates. The client certificates that you generated are, by default, located in 'Certificates - Current User\Personal\Certificates'. 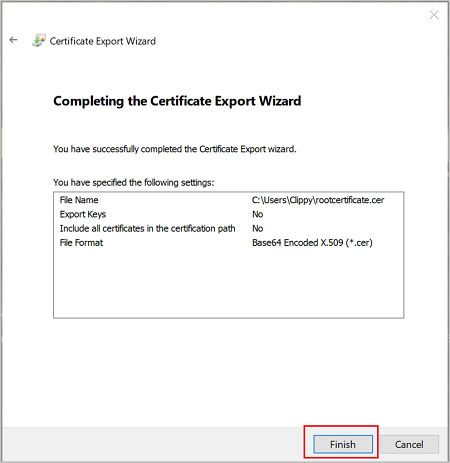 Right-click the client certificate that you want to export, click all tasks, and then click Export to open the Certificate Export Wizard. Select Yes, export the private key, and then click Next. On the Export File Format page, leave the defaults selected. Make sure that Include all certificates in the certification path if possible is selected. 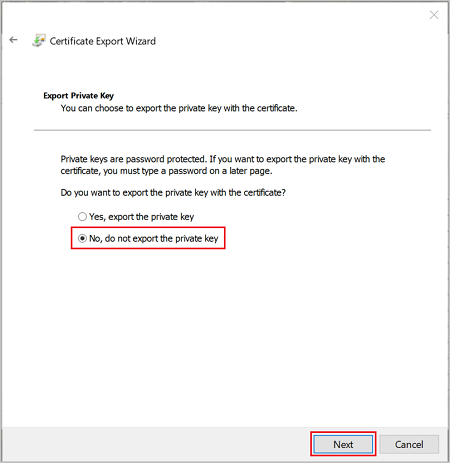 This setting additionally exports the root certificate information that is required for successful client authentication. Without it, client authentication fails because the client doesn't have the trusted root certificate. Then, click Next. To install a client certificate, see Install a client certificate. Continue with your Point-to-Site configuration. 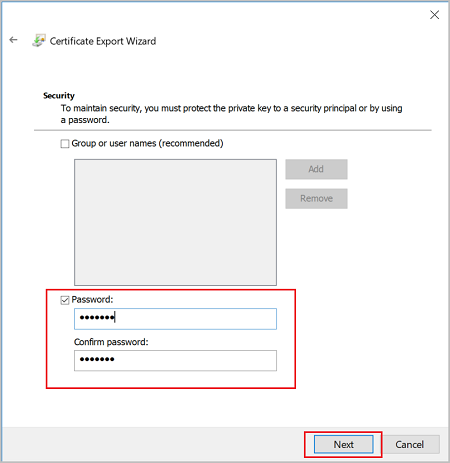 For Resource Manager deployment model steps, see Configure P2S using native Azure certificate authentication. For classic deployment model steps, see Configure a Point-to-Site VPN connection to a VNet (classic). For P2S troubleshooting information, Troubleshooting Azure point-to-site connections.